Completed in 80 A.D., the Colosseum once held 50,000 to 60,000 people and reached an impressive 130 feet in height. Rome, Italy (CNN) -- Visitors to a popular tourist destination in Rome should soon get their first look at a once-formidable world that has been hidden from public view for nearly 2,000 years. For the first time, the Colosseum plans to let visitors explore an underground corridor that has previously been off limits. It's a place where gladiators once prepared for battle and lions and tigers were caged before entertaining a bloodthirsty public, architect Barbara Nazzaro of the office of the Rome Archaeology Superintendent told CNN. The Colosseum plans to open the underground section in August. In the underground maze of tunnels, the Romans kept "every type of exotic animal that they were able to bring here," including rhinos and snakes, Nazzaro said. Elephants and other animals could walk freely without scraping their head on the ceiling -- with plenty of room to spare. Completed in 80 A.D., the Colosseum once held 50,000 to 60,000 people and reached an impressive 130 feet in height. It was constructed with enough stone to build a 15-story building, though less than half of the structure now remains, said Nazzaro. For more than 400 years, wealthy and poor alike attended ultra-violent spectacles in the Colosseum, including executions which often concluded with fights between Roman warriors. There were four floors, each dedicated to a specific class, according to colosseum.net, a website dedicated to amphitheaters and coliseums around the world. The upper floors were for the lower classes and women, while the lowest was for the most prominent citizens, sitting just above the underground passageways. The more gore and blood, the happier and more involved people became, Nazzaro said. "It is difficult to understand nowadays." Listed as one of the seven wonders of the world, the Colosseum requires the equivalent of more than $860,000 a year (700,000 euros) to maintain, according to the archaeology superintendent's office. 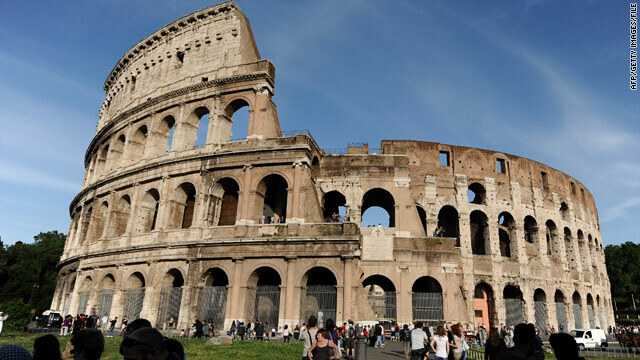 Opening the underground corridor for the public will coincide with an extensive restoration of the Colosseum, the office said. It will cost an estimated $2.5 million (2 million euros) to open the new attraction to tourists. Yet restoration plans don't stop there. Efforts to find sponsors to help fully restore the entire Colosseum, including more of the underground section, are underway. That could cost the equivalent of another $40 million (32 million euros), officials said. The Colosseum attracts an estimated 4 million tourists a year and generates roughly $38 million (about 30.5 million euros) in revenue from such things as ticket sales and souvenirs, according to the archaeology superintendent's office.